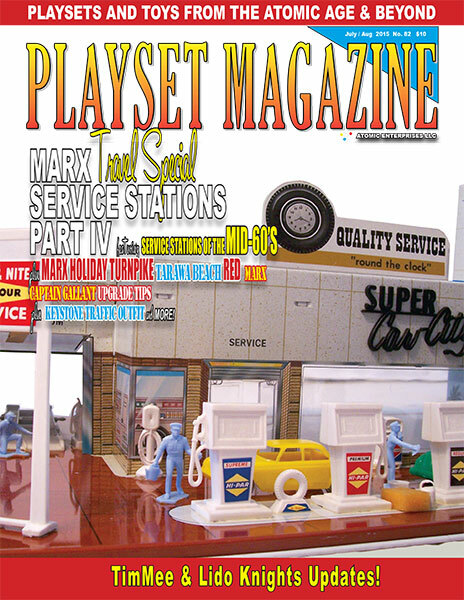 As PM82 rolls off the presses destined to find places in mailboxes and homes across the nation, it seems important to remember that the mission here is to chronicle the Marx playset from its infancy throughout its history. That is why we sometimes dote on a theme like loving grandparents, and the great Service Station Story is among those sets requiring infinite detail and persistence of vision until the entire story is told. 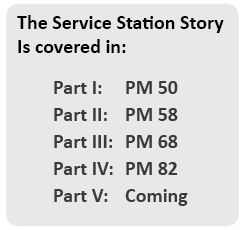 We actually thought the mission would be complete with this fourth installment, but the topic proved too rich for a quick finale. This time we cover those sets that cross into the late 60’s, but Marx did them very well it turns out and there is a lot to like here. There is a new set of figures for instance, which has never before been covered. And we see how Marx orchestrated parts and accessories, even mixing structures, to come up with new visions of this nearly ubiquitous phenomenon of the toy world. And so, expecting a quick dispatch we were actually quite taken by the subject even if it did carry us into the less well-traveled regions of the late 1960’s. In fact, it opened up a new area of sets to be covered in the fifth and absolutely final installment to be seen on these pages next issue as well. It’s Summertime and moms and dads everywhere are starting to venture out on family journeys with kids in tow, suitcases in the trunks and a whistle on the lips. What exactly was the appeal of the Service Station as a playset? Was it the busy attendant in a clean uniform, cheerful and busy? The coming and going of cars, the “ding ding” of the bells as tires pass over, the plentiful pumps and equipment? Or the opportunity for the small guy to sell a new battery, keep a motor humming with fresh new oil, or just wipe the windshield. Yes, we hit the happy highways visiting one service station after another on our way to completing a five-issue marathon of those fabulous tin litho structures so important to Marx’ bottom line. We’ll get from 1965 to 1969 with your friends George Kroll, Jim Trever, Gary Carlington, Len Hardt and a lot of Magic Marxie! And there is so much more this issue -- a real refresher for Captain Gallant Fans. It’s how to upgrade your sets with commonly available Marx parts (and one or two not so common), perfect for those who keep their sets on display or who want a good excuse to take theirs out and set it up anew. Next, you can travel the super freeway with the Marx Holiday Turnpike with Bill Aber. This is a tin litho toy with ten cars speeding their way around, all controlled by the junior operator. And a super colorful Tim-Mee and Lido Knights update with some of the most colorful original and mint packaging it definitely stands on its own as a walking billboard for why we love those mid-50’s sets so much. And it is hosted once again courtesy Mark Hegeman. Our wartime spirit is satisfied by a surprise Parting Shots! visit to Beach Red Tarawa for a fantastically well-photographed feature courtesy Edmund Bodewell. Sounds like fun to us! And by the way, we’re finding out that later 60’s stuff has many charms all its own, so jump into the family sedan for an excursion direct into the past. And as always, thank you kindly for joining us.